"12 Steps: A Solo Performance Piece." Image courtesy of McDaniel College. “12 Steps: A Solo Performance Piece,” written by Theater Professor Richard Sautter, delivered a combination of laughter and deep pondering the night of Feb. 11 in WMC Alumni Hall. The performance was well-received by a crowd of students and community members alike. Sautter depicts the struggles of being an actor through a series of comical yet thought-provoking “sketches,” if one assumes that each step presents a new sketch, that is. 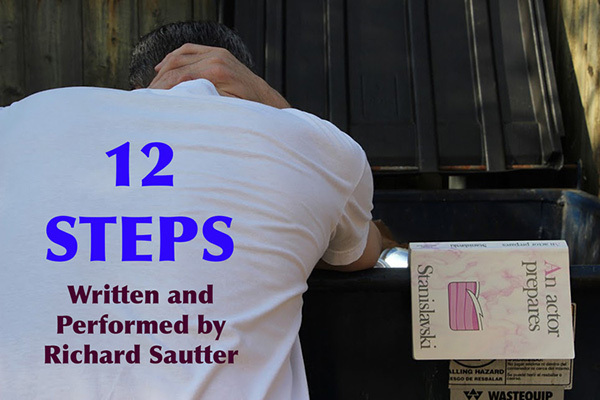 By utilizing the 12 steps program from Alcoholics Anonymous, Sautter constructs a narrative frame that is both familiar and amusing for the audience. Perhaps most memorable about “12 Steps” is its postmodern themes. From using pop culture to create a narrative frame to being self-referential, the performance was, with no doubt, one of the most postmodern plays this author seen. Let’s take a closer look at how “12 Steps” falls under this categorization, regardless of Sautter mentioning it is not. To begin with, every postmodern text draws from pop culture and makes reference to the popular media. In the case of “12 Steps,” this is readily seen in the title itself, as it makes reference to the 12 steps program. This is not the sole pop culture reference in the play: there is also a moment where Sautter references being in a movie by renowned director M. Knight Shyamalan. Postmodern texts oftentimes utilize master narratives to present and develop their narrative. It is just the case that “12 Steps” utilizes a couple of master narratives to do so. The first and most evident, again, is the addiction recovery narrative presented in pop culture. This narrative always presents a character going through the struggles of addiction only to conclude with the now infamous line “My name is ____, and I am an addict.” Sautter thus uses this exact same framework to present his personal narrative. Another master narrative that Sautter uses is that of the starving artist. This one is self-explanatory: the artist, no matter his or her medium, will always struggle before he or she succeeds. Sautter exploits this narrative to the point of satire, attempting to show that the myth may not at all be a myth. It is important to point out, however, that although Sautter utilizes these narratives, he is twisting them and changing them to fit his narrative, almost to the point of creating a parody of these narratives. Although referencing pop culture and utilizing master narratives characterize postmodern texts, there is one key element that differentiates these texts from the rest: self-referentiality. What is meant by this is that the text makes reference to itself, creating a type of meta-theater that brings back the attention to the main story, in this case, the narrative of Sautter’s career as an actor. Time and time again, Sautter references his own show by wittily denying that this is not a performance at all, and rather believing it to be an intervention, or, in his words, “a cry for help.” It is this wit what has made his show popular among audiences, specially among the theater community. Overall, “12 Steps: A Solo Performance Piece” is a postmodern gem that depicts the struggles of actors, and artists alike, in a world that has turned its face away from the arts.